Hey Holly Golightly: what can i do with my extra herbs? salsa verde! 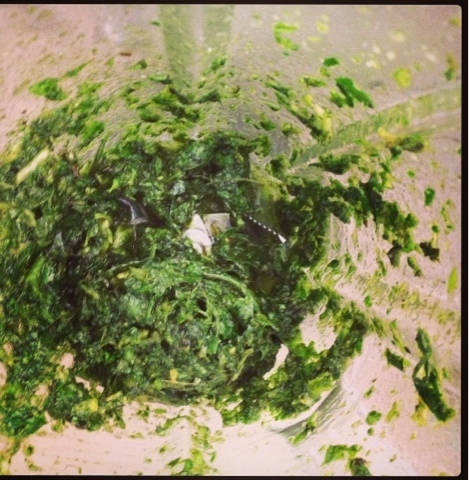 Salsa Verde is an Italian dressing traditionally made with oil, vinegar, parsely, mint and basil. BUT as necessity is the mother of invention I have made some changes to that recipe! A few days ago I posted about 100 Things - the sustainable farming movement encouraging us all to take responsibility and find aways to be more sustainable. If you are not fortunate enough to have your own thriving herb garden you might find yourself being required to purchase more of the stuff then you could ever use (why do they sell it in such large bunches?). Food wastage in this country alone is huge! So if you do find yourself with herbs lying around try salsa verde. You'll be glad you did! What to do: Chop the herbs as finely as you can or use a blender if you have one handy (I find chopping and then blending the best method). Add some finely chopped garlic, extra virgin olive oil and few splashes of white wine vinegar (or any vinegar you have on hand really) and finally some salt and pepper. You are wanting the consistency to be a runny paste and the oil/vinegar ratio to be 2:1. You can be as imaginative as you like and your salsa verde will add some zing to meat, fish and poultry and can even liven up a homemade pizza or a toasted sandwich. The best part is that your salsa verde will last covered in the fridge for well over a week making those left-over herbs useful long after they otherwise would have wilted, died and found their way to the rubbish.